Tunisia was historically inhabited by Berbers, becoming the seat of Carthage and later part of the Roman empire. Arab dynasties ruled between the 8th and 13th centuries, followed by the Ottomans from the 16th to the 19th century and then by French colonisation until independence in 1957. It had a relatively stable democracy until civil unrest in 2011, which saw a change in government, and an a return to more stable conditions. Tunisia’s economy is dominated by the service sector (accounting for over 60% of GDP), including tourism. Petroleum products account for over 11% of exports. Other inmportant sectors are industry (25% of GDP) agriculture (around 11% of GDP) and mining. Tunisia has the highest access rates to water supply and sanitation in the Middle East and North Africa. Access to safe drinking water became close to universal, approaching 100% in urban areas and 94% in rural areas. With its semi-arid to arid climate, surface water resources are scarce in the south of the country, but the northern coastal region has relatively abundant rainfall and surface water resources . Groundwater is the main source of water – both shallow renewable and deep, often non-renewable groundwater. Over 75% of groundwater is used by agriculture; most of the rest is for domestic supply. Uncontrolled over-abstraction of groundwater, largely for irrigation by small farmers, is causing over-exploitation of aquifers in some areas. Please cite this page as: Ben Ammar, Mekni, Upton, Ó Dochartaigh and Bellwood-Howard, 2018. Tunisia. Map developed from USGS GTOPOPO30; GADM global administrative areas; and UN Revision of World Urbanization Prospects. For more information on the map development and datasets see the geography resource page. Tunisia has a long coastline onto the Mediterranean Sea. In the north of the country is the Tunisian Dorsale mountain chain, which rises to 1,554 m. In the centre of the country are a series of east-west trending depressions, called chotts. The south of Tunisia is dominated by the Sahara. Tunisia has a semi-arid Mediterranean climate in the north; arid in the centre, and desert (Saharan) in the south. 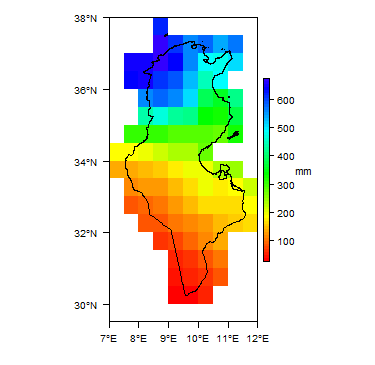 Rainfall distribution is determined by the direction of the prevailing winter winds (north-west) and the presence of high ground, and is heaviest in the north (over 400 mm/year and up to 1,500 mm/year in the far northwest), declining towards the centre (150 to 300 mm/year) and becoming very light in the south (less than 150 mm/year and less than 50 mm/year in the far south), with some years of no rain. 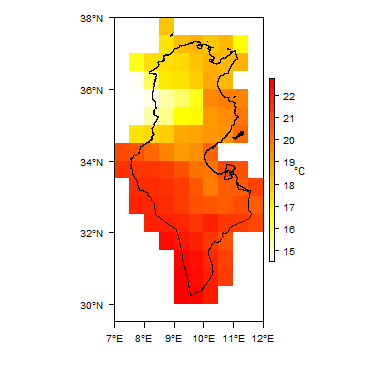 More information on average rainfall and temperature for each of the climate zones in Tunisia can be seen at the Tunisia climate page. The main permanent surface watercourses which drain to the sea are in the north, mostly rising in the northwest and flowing eastwards. In the arid central reason, surface watercourses are ephemeral, flowing only for a few days or weeks a year. In the south, surface flows are rare and small. None of these central and southern ephemeral flows reach the sea; instead, surface water infiltrates over plains or in inland depressions (sabhkas). The Direction Generale des Ressources en Eau (DGRE) and the General Direction of Dams and Hydraulic Works (DGBGTH) operate 75 surface water gauging stations and 164 gauging points. The frequency of observation and length of record varies from one station to another. There are most stations in the Mejerda River basin, the largest in Tunisia. The collected data for 2003-2004 are available in the report DGRE (2004) (see References, below). Major surface water features of Tunisia. Map developed from World Wildlife Fund HydroSHEDS; Digital Chart of the World drainage; and FAO Inland Water Bodies. For more information on the map development and datasets see the surface water resource page. The north of Tunisia is dominated by calcisols with some fluvisols and, along the coast, luvisols. The centre of the country includes cambisols and gypsisols, with smaller areas of solonchaks and leptosols. The south is dominated by leptosols, cambisols and arenosols, with smaller areas of gypsisols. 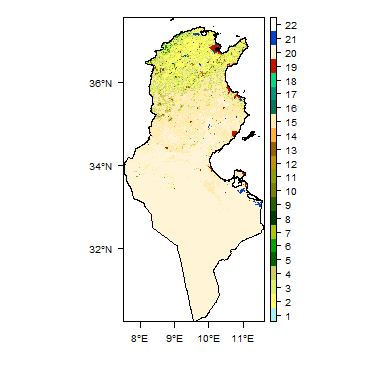 Soil Map of Tunisia, from the European Commission Joint Research Centre: European Soil Portal. For more information on the map see the soil resource page. In the north of Tunisia is a belt of rain-fed cropland with natural grassland, shrubland and forest. The centre of the country has sparse vegetation; and the south has very little or no vegetation. Land Cover Map of Tunisia, from the European Space Agency GlobCover 2.3, 2009. For more information on the map see the land cover resource page. These statistics are sourced from FAO Aquastat. More information on the derivation and interpretation of these statistics can be seen on the FAO Aquastat website. This section provides a summary of the geology of Tunisia. More detail can be found in the references listed at the bottom of this page. Many of these references can be accessed through the Africa Groundwater Literature Archive. The geology map on this page shows a simplified overview of the geology at a national scale (see the Geology resource page for more details). More detailed geological maps are published by the Service Geologique de Tunisie (at 1:500,000 scale) and the National Office of Mines (ONM) (at 1:50,000 and 1:100,000 scale) (see Geology: Key References, below). Geology of Tunisia at 1:5 million scale. Based on map described by Persits et al. 2002/Furon and Lombard 1964. For more information on the map development and datasets see the geology resource page. The north of Tunisia has been extensively affected by tectonic movements, with anticlines and synclines generally trending southwest - northeast, and a series of faults. The central part of the country includes two big sedimentary basins of Miocene and Pliocene-Quaternary age, which have been less heavily tectonized. In the south of the country, the Saharan platform is a largely undeformed basin which saw sedimentation from Triassic to Quaternary. Alluvial plains, including Ghardimou,Kalaa Khasba, Oued Guinniche basin (northern Tunisia) and Kairouan and Sfax basins (central Tunisia) Tertiary to Quaternary Detrital formations that vary considerably in thickness from less than 20 m to more than 700 m.
Series of marine and continental formations Cretaceous - Tertiary - general Cretaceous and Tertiary sedimentary formations occur across most of Tunisia. Across the centre and north of the country are many different marine and continental sedimentary formations. Continental sandstones occur in major sedimentary basins across much of central Tunisia, sometimes directly underlying Quaternary unconsolidated alluvium, such as in the Sfax basin and the Pliocene-Quaternary Kairouan basin. Small outcrops of limestone formations, sometimes with marls, dolostones, gypsum and other evaporates, are scattered across northern and central Tunisia, often interbedded with sand formation. Complex Terminal (CT) Upper Cretaceous - Tertiary The Complex Terminal is one of the two main formations in the south of Tunisia (the other is the Continental Intercalaire, below). It comprises Upper Cretaceous (Senonian and Turonian) carbonate rocks; and Tertiary (Mio-Pliocene) detrital sand formations. Continental Intercalaire (CI) Lower Cretaceous The Continental Intercalaire is one of the two main formations in the south of Tunisia (the other is the Complex Terminal, above). It comprises a continental facies of sands, limestones and clays. Triassic - Jurassic Limited; occurs at the base of the southern CT and CI series, and in small outcrops in the north. In the south, includes Triassic sandstones, dolomites and gypsum; overlain by Jurassic marls, limestones and dolomites. This section provides a summary of the hydrogeology of the main aquifers in Tunisia. More information is available in the references listed at the bottom of this page. Many of these references can be accessed through the Africa Groundwater Literature Archive. A more detailed hydrogeological map at 1:500,000 scale is published by the DGRE (Zebidi 1991), and a different simplified map is published by SEMIDE (see Hydrogeology: Key References, below). Deep aquifers - more than 50 m deep. In the following summary and in the hydrogeology map above, most of the aquifers are classified as dominantly unconsolidated, in which groundwater flow and storage is entirely intergranular. The Complex Terminal and Continental Intercalaire aquifers - the principal aquifers in southern Tunisia - are treated separately; these aquifers have a mix of intergranular and fracture flow. Sfax basin (Tertiary) The Sfax basin in the east of the country is a sand sequence and forms an important coastal aquifer system, of Tertiary (Upper Miocene) age. The aquifer sequence is between 50 and 90 m thick, and it is buried at depths of between 200 to 600 m. The aquifer is confined. Piezometric water levels are 200 to 600 m deep. Boreholes abstracting from the aquifer are typically between 190 and 600 m deep. Transmissivity values for the aquifer range from 0.1 to 7.3 x 10-2 m2/sec. Storativity values range from 0.7 to 1.8 x 10-4. Annual abstraction from the Sfax basin aquifer in 2000 was 19.16 million cubic metres (Mm³), from a total of 41 boreholes. Of this, abstraction for industrial use was 13.25 Mm³; for agriculture was 4.57 Mm³; and for domestic use was 1.34 Mm³. 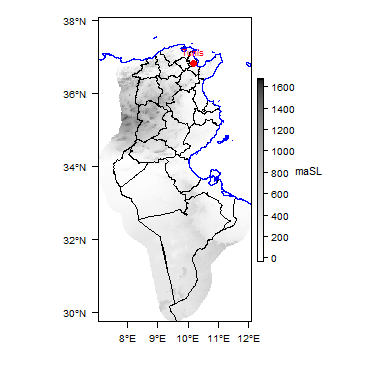 Total dissolved solids in groundwater in the Sfax basin aquifer range from 2.5 to 10.5 g/l. There is recent recharge to the aquifer in the upstream region. In the downstream region, stable isotope and radiocarbon data have shown that there is no active recharge. Kairouan plain (Tertiary - Quaternary) This is the most important aquifer system in central Tunisia, formed of detrital alluvial sediments of Plio-Quaternary age, which can be more than 700 m thick. The aquifer is unconfined and the water table depth ranges from 1 to 700 m. The aquifer is exploited both by large diameter dug wells only a few metres deep, and by boreholes that can be more than 700 m deep; the mean borehole depth is between 100 and 250 m.
Transmissivity values for the aquifer range from 4.8 x 10-4 to 2.3 x 10-2 m2/sec. Storativity values range from 1.5 x 10-4 to 1 x 10-3. Annual abstraction from the aquifer in 2000 was 53.5 million cubic metres (Mm³). Of this, 26 Mm³ was from a total of 118 boreholes, and 27.5 Mm³ was from a total of 4000 wells. Total dissolved solids in groundwater from the aquifer range from 1 to 3 g/l. Active recharge comes from direct infiltration of precipitation on the plain, and from water released from the Sidi Saad (Zeroud) and El Haouereb (Merguellil) dams. Before the dams were constructed, recharge occurred during flood events in the Oued Zeour and Merguellil areas. Oued Guinniche Basin (Tertiary - Quaternary) This is one of the most important aquifers in northeastern Tunisia. It is a multi-layered aquifer system, formed of heterogeneous alluvial deposits of Plio-Quaternary age. The aquifer is typically 100 to 200 m thick in total. There is an upper aquifer layer, which is unconfined, with a water table depth of less than 50 m; and a deeper layer, with a piezometric water level of 200 to 300 m depth. Boreholes abstracting from the aquifer are between 50 and 300 m deep. Transmissivity values range from 3.1 to 130 x 10-5 m2/sec. The mean storativity value is 5.5. Annual abstraction from a total of 233 boreholes is on the order of 8 million cubic metres (Mm³) (data from 2012) and from a total of 1540 wells is 11 million cubic metres (Mm³) (data from 2008). Total dissolved solids in groundwater from the aquifer range from 0.3 to 4 g/l. There is active and rapid recent recharge by direct infiltration of precipitation. Local Cretaceous - Tertiary sedimentary aquifers A series of more local scale sedimentary aquifers is scattered across northern and central Tunisia, often composed of an interbedded sequence of marine sandstones and limestones and continental sandstone formations. Some of the limestone formations are karstic. In the sandstone formations, groundwater flow can be by both intergranular and fracture flow. One example is the Korba aquifer in the Cap Bon peninsula, where Tertiary continental sandstones pass upwards into marine limestones, which are overlain by Quaternary deposits. Maliki MA (2000); Maliki et al. (2000); Nazoumou (2002); Ben Ammar (2007); Ben Ammar et al. (2009); Leduc et al. (2007); Ben Ammar et al. (2006); Jeribi (2004). Complex Terminal (CT) (Upper Cretaceous - Tertiary) The Complex Terminal (CT) aquifer is formed by Upper Cretaceous (Senonian and Turonian) carbonate rocks, which occur in Tunisia between the Dahar mountains and the eastern part of Chott Jerid; and by Tertiary (Mio-Pliocene) detrital sand formations in the west and south of Chott Jerid. The aquifer outcrops at the ground surface in the Dahar mountains in the southeast, and is present between about 300 to 700 m depth in the Jerid region. The aquifer thickness varies from 30 to 200 m. The aquifer is typically confined. Boreholes abstracting from the aquifer in the Jerid and Nefzaoua regions are between 225 and 400 m deep. Parts of the carbonate formations are karstic. The carbonate formations of the CT aquifer have a typical range in transmissivity of 50 x 10-3 to 300 x 10-3 m²/sec. The sand formations have a typical transmissivity range of 1 x 10-3 to 5 x 10-3. Storativity values for the CT aquifer range from 1 to 8 x 10-5. Annual abstraction from the CT aquifer in 2000 was 451.6 million cubic metres (Mm³). Total dissolved solids in groundwater from the CT aquifer are between 0.7 and 7 g/l. Recharge to the aquifer comes from the Algerian Atlas mountains; from the Dahar uplands in southeast Tunisia; and from mountains in the northern part of the Chott. Continental Intercalaire (CI) (Lower Cretaceous) The Continental Intercalaire (CI) aquifer in southern Tunisia is of Lower Cretaceous age (Neocomian, Barremian, Aptian and Albian). It comprises detrital and continental formations, between 125 and 150 m thick, which are buried at depths of 1500 to at least 2400 m. The aquifer is confined, and piezometric water levels range from 500 to 3500 m depth. Aquifer transmissivity values range from 0.8 to 170 x 10-3 m2/sec. Storativity values range from 0.2 to 1.4 x 10-4. Annual abstraction from the CI aquifer in 2000 was 83.1 million cubic metres (Mm³). Total dissolved solids in groundwater in the CI aquifer aquifer are between 1.5 and 4 g/l. Recharge to the aquifer comes from the Algerian Atlas mountains. The total water resources in Tunisia are estimated (by DGRE) at 4,825 million cubic metres (Mm³), of which 2,125 Mm³ are groundwater. Of this volume, there is an estimated 745 Mm³ of groundwater stored in phreatic (unconfined) aquifers (55% in the north of the country; 30% in the centre; and 15% in the south). Some 1,380 Mm³ of groundwater is stored in deep (confined) aquifers, of which only some 650 Mm³ is renewable (18% in the north; 24% in the centre; and 58% in the south). Abstraction from phreatic aquifers in 2000 was estimated at 780 Mm³, from 90,000 wells. This is equivalent to 105% of the estimated total storage in phreatic aquifers. Abstraction from deep aquifers in 2000 was estimated at 1,100 Mm³, from 3,500 boreholes. This is equivalent to 80% of the estimated total storage in deep aquifers. The DGRE publishes an annual report on the exploitation of deep aquifers; and a report every 5 years on the exploitation of phreatic aquifers. Salinisation of groundwater is widespread in Tunisia, linked to intensive exploitation; to the geochemical nature of geological deposits; and sometimes to leaching of irrigation water. Salinity generally increases towards the south and in older (fossil) groundwater: much of the groundwater in the south and parts of the centre of the country has total dissolved solids (TDS) of more than 3 g/l; and in much of the centre and north groundwater TDS is typically between 1.5 and 3 g/l. Saline intrusion in the coastal aquifers is also problematic. Abstraction from phreatic aquifers is from around 90000 wells, equipped with motorised/electric pumps. Abstraction from deep aquifers is from around 3500 boreholes and springs, of which 60.5% are pumped boreholes; 35% are artesian boreholes; and 4.5% are springs (data from DGRE). Irrigation in Tunisia uses 2.14 billion m³/year (data from 2012), of which 74% comes from groundwater. Much irrigation is based on a system of family farms using thousands of shallow wells, many of which are uncontrolled by the Ministry of Agriculture. This is leading to aquifer over-exploitation, especially as wells and boreholes are increasingly converted to use electric pumps. The Direction Générale des Ressources en Eau (DGRE) / General Direction of Water Resources. This institution has a representation in all 24 departments in the country. The Société National d’Exploitation et de Distribution des Eaux (SONEDE) / National Water Distribution Utility (www.sonede.com.tn). This institution has resposibility for exploiting and distributing domestic water supplies. The legal framework for groundwater management falls under the Law No. 16-75 of 31 March 1975 on the promulgation of the Water Code. A revised version of the Law is under preparation. A permit from the DGRE is required for drilling any borehole or well exceeding 50 m in depth. Private abstraction from shallow aquifers less than 50 m deep is not regulated, and as a result, many are over-exploited. Some river basins suffering from overexploitation or/and pollution are protected, and no drilling permit is allowed in these basins. There is strict regulation of waste disposal or polluted water discharge, but in some cases overruns can occur. Domestic water is treated by the ONAS (Office National d’Assanissement) / National Sanitation Utility. Irrigation schemes are managed by Agricultural Development Groups, of which there were over 2800 in 2009. A minority of these deal only with groundwater irrigation. A number of experiments into artificial recharge using treated waste water were carried out between 1992 and 2006 in the Cap Bon aquifer. Enhanced recharge of flood waters is carried out at at least 35 sites, and is expanding, using engineered structures in wadis (both above and below ground) and other areas prone to flooding, in order to dam up flood water and allow it to infiltrate to underlying aquifers. Depending on the availability of surface water from year to year, there is between 30 and 70 million m³/year of artificial recharge in Tunisia. The north of the country, where surface water flooding occurs most often, is most suited to this practice. It is also useful in the centre of the country, where floods are still relatively common (10-15 per year); here, artificial recharge of flood waters is combined with soil conservation practices to ensure maximum underground storage of water (Louati & Bucknell 2010). Groundwater level monitoring is done twice a year by different departments of the DGRE (there are 24 departments covering the country), using a piezometric network of more than 2,000 shallow wells and more than 1,100 deep boreholes (SEMIDE). DGRE publish an annual report on the piezometric monitoring of deep aquifers, and a 5-yearly report on the piezometric monitoring of the phreatic aquifers. See also Horriche & Besbes (2006). Groundwater quality is monitored twice a year by the DGRE, in September-October and March-April, at more than 1214 points: 736 wells in phreatic aquifers and 478 boreholes in deep aquifers. The main parameters monitored are total dissolved solids (TDS) and nitrate (NO3). The DGRE publishes the monitoring results in regular (annual or 5-yearly) reports. The SEMIDE programme also publishes monitoring results online. Boreholes from which groundwater is abstracted for domestic use by SONEDE are monitored monthly. SONEDE analysed 55,886 water samples in 2013. These results are published online by SONEDE. Groundwater in the Djeffara coastal basin aquifer is shared between Libya and Tunisia. 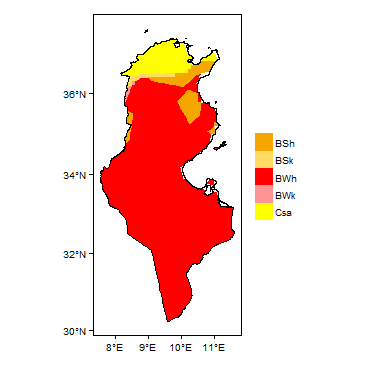 Fossil groundwater in the Continental Intercalaire (CI) and Complex Terminal (CT) Northwest Saharan Aquifer System in the south of the country is shared between Tunisia, Algeria and Libya. This aquifer system has more than 1 million km³ of stored groundwater, of which some 80,000 km³ are in Tunisia. Tunisia, Algeria and Libya have established a commission to monitor the aquifer and have agreed to cooperate on its management to mimimise cross-border impacts - this is one of only two such agreements in the world. Many studies of the aquifer are carried out by the Observatoire du Sahara et du Sahel (OSS). National Office of Mines (ONM). The ONM publish geological maps at various scales, e.g. 1:50,000 for the north and central parts of the country and 1:100,000 for the south. Service Geologique de Tunisie. 1985. Carte geologique de Tunisie; 1:500,000. Castany G. 1951. Etude géologique de l'Atlas Tunisien oriental. The national department for water resources management and mobilization. Annuaire piezometrique de Tunisie (annually since 1990, with groundwater level/piezometric data from nearly 2500 monitoring points). Euro Mediterranean Information System on the Know-how in the water sector. Ben Ammar S, Zouari K, Leduc C et M'barek J. 2006. Caractérisation isotopique de la relation barrage-nappe dans le bassin du Merguellil (plaine de Kairouan, Tunisie centrale). Hydrological Sciences Journal, 51, 2, 272- 284. Ben Ammar S, Favreau G, Zouari K, Leduc C, Beji R et M’barek J. 2009. Approche géochimique de la vulnérabilité des eaux souterraines de la nappe phréatique de la plaine de Kairouan (Tunisie). Sécheresse, 20, 1, 87-95. DGRE (Direction Generale des Ressources en Eau). 2004. Annuaire Hydrologique de Tunisie 2003-2004. Ecole nationale d’ingénieurs de Sfax. 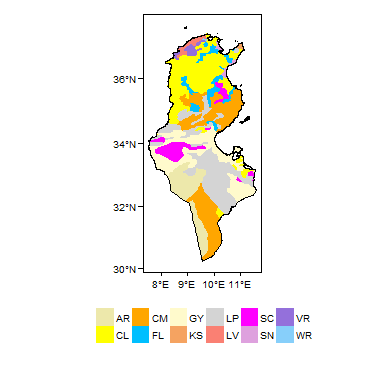 Mapping groundwater resources: Tunisia. Horriche F et Besbes M. 2006. Analyse du réseau piézométrique national tunisien. Journal of Water Science, 19 (4), 347-363. Leduc C, Ben Ammar S, Favreau G, Béji R, Virrion R, Lacombe G, Tarhouni J, Aouadi C, Zenati Chelli B, Jebnoun N, Oï M, Michelot JL et Zouari K. 2007. Impacts of hydrological changes in the Mediterranean zone: env ironmental modifications and rural development in the Merguellil catchment, central Tunisia. Hydrological Sciences Journal, 52 (6), 1162-1178. Louati ME and Bucknell J. 2010. Tunisia's experience in water resource mobilization and management. Development and Climate Change WDR2010 Background Note. OSS (Observatoire du Sahara et du Sahel). 2003. Systeme Aquifere du Sahara Septentrional: gestion commune d’un bassin transfrontière. Rapport de synthese, 1ere edition, Janvier 2003. Tunisian Institute for Strategic Studies. 2014. Système Hydraulique de la Tunisie à l’horizon 2030. Zebidi H. 1991. Carte des Ressources en Eau de la Tunisie; echelle 1:500,000. Direction Generale des Ressources en Eau. This page was last modified on 19 March 2019, at 15:09.